Home » TEACHING RESOURCES » WRITING ABOUT READING » Love it – or Loathe it? What should we look for in student writing? 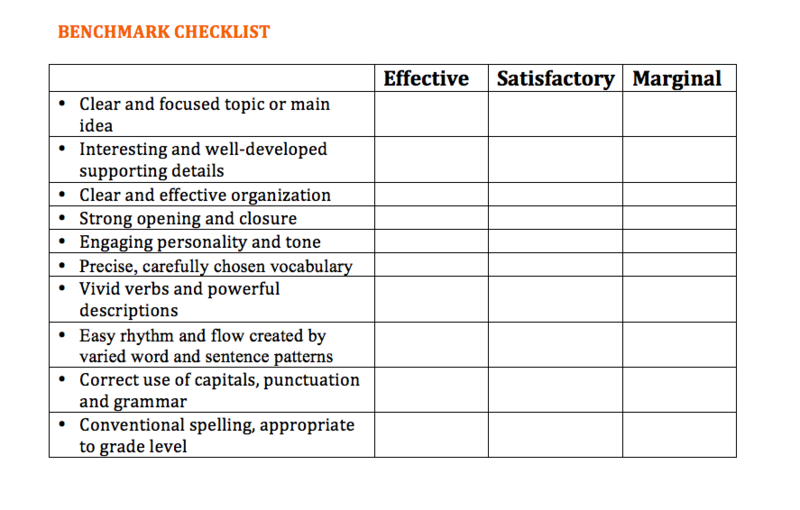 This quick and easy checklist can help you identify what your students know and can do as writers. Click here or on the image below for a printable pdf and a more detailed three-level rubric. Use the Love it or Loathe it Chart below or another prompt to gather writing samples. Then use the information to plan further instruction. Here’s a writing lesson for the first day of school! Students need to learn that the best writing comes from topics they care about. What’s better than something we absolutely love or absolutely loathe? Introduction: Tell students that the best writing comes from topics that a writer feels strongly about. In this lesson, they will have an opportunity to generate a list of things they absolutely love and things they absolutely can’t stand. It may be necessary to define the word loathe for some students, but it could be a great addition to their vocabulary! Later, they can tuck this list into the “Ideas” pocket of their writing folders to be available as topics for writing. The “loves” and “loathes” can lead to equally strong feelings and strong writing. Instruction: Model, model, model! Even something as simple as a two-column chart should be demonstrated before students are expected to tackle it on their own. Make a T-chart by folding a piece of paper in half. Label one half “Love It” and the other half “Loathe It.” In each column, generate a list of objects, food, places, activities, habits, hobbis, and beliefs that you adore or abhor. (The only rule is: no people’s names in the “Loathe It” column.) As you write, talk through your thinking for the students. Guide students as they create their own “Love it or Loathe it” charts, with about 6-10 topics in each column. Have students tuck their charts into their writing folders or topic pockets to use as topics for writing. After students have generated their “Love it or Loathe it” lists, have them choose any topic on their list and just write whatever they want about it. If they finish before the time is up, they should choose another topic and write about it. On the next day, invite students to finish their original pieces or start a new piece. Continue this for two or three days and you will have a collection of samples to use for assessing what your students know and can do as writers.